Each violation mentioned above has an entire article dedicated to it – click on a few to read about what we see in the field every day. While there are many issues and violations in the joint use world, there are a few we see so often that we consider them problems of interest: repeat offenses to which no one is immune. Our Operations Manager in the Pacific Northwest, Justin Boone, paints a clear picture of conditions in the field, especially regarding the National Electric Safety Code. A member of the Oregon Joint Use Association’s Standards Committee (OJUA), Justin shared that today’s most common NESC violation is a damaged or abandoned communications drop. Previously at number four on our top ten list, this violation has leapt to the forefront. When an attacher removes equipment from a pole, sometimes pieces and parts are left behind. Unused and unclaimed drops are easy to miss. Wind and snow can also take down or damage communication drops. Regardless of the cause, the abandoned or damaged drop can remain dangling in the wind or coiled next to a pole, impeding pedestrian walkways, creating snags for cars and bicyclists, and generally becoming a danger to the public. Justin was quick to note that while the communications drop may be home to the most common violation, it certainly isn’t the most important. The most critical violations on any asset are those related to power. Utility linemen learn how to safely work in the power space, and have the experience and tools to keep them safe. However, not all field technicians are trained to work in the power space. The most important NESC guidelines – and therefore the most critical violations – relate to the required distance between the power space and the communications space. Such distance has remained consistent from the 2012 NESC Guidelines to now: there should be a 40-inch distance between power and the highest communications line. One of the most noteworthy changes from the previous edition of the NESC Guidelines concerns another one of Alden’s Top Ten violations: guy markers. These cables lead from the pole to the ground and must be properly placed so they don’t impede traffic or pedestrian movement. In the past, the NESC advised that every guy marker should be sheathed in brightly colored plastic to increase visibility. 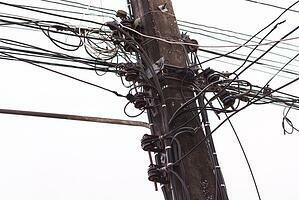 Wires that were not covered were considered a violation. The NESC changed its recommendation on guy markers. Now only the lowest and highest guy wires must be covered – additional wires can remain uncovered. While changes to the NESC Guidelines are often subtle, they can mean substantial impact in the field. The best way to maintain complete visibility of the status and condition of your plant—including potential and existing NESC violations—is through regular, thorough field inspections. It is worth the investment to reduce your liability, improve safety for your staff and the public, and lower your costs for fines.